California communities have been told to cut water use by 25 percent in the midst of a historic drought, but more than a million people don’t have access to clean drinking water. In some rural areas the water is polluted with arsenic, bacteria and more. The affected families can be found in the rural communities of Eastern Coachella Valley and South Kern, and are known to spend 10 percent of their earnings buying bottled water and other alternatives because the local supply tastes bad, has a dirty appearance or suffers from general contamination. The policy brief studied water contaminants and consumption habits in two rural towns in California’s Central Valley, mostly inhabited by immigrant agricultural workers using 13 water systems, two of which are state-regulated and 11 smaller public and private systems, including wells. The study found every single one had contaminant-level violations at some point over the last 12 years, with traces of bacteria, arsenic and disinfection byproducts detected. 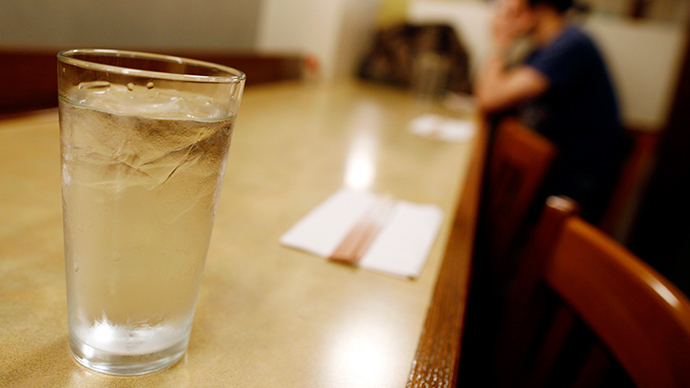 Contaminated water can cause cancer, thyroid problems and other serious health issues. Families resort to drinking from bottles or a filtration system, but both are costly. The extra cost and fear about water contamination is creating another health issue as people begin purchasing sugar-sweetened beverages instead, leading to growing levels of diabetes. In the last decade, there has been a 35 percent increase. Conner Everts, facilitator for the Environmental Water Caucus, told RT that a lot of people are dependent on groundwater. “They may not have access to …snowmelt water, which goes right by them and is delivered to ‘Corporate Ag’ or to Southern California. They are relying on ground water that is not only polluted with chemicals like [arsenic], but nitrates, which are clear and you can’t tell” when they are in the water," Everts said. A pilot program is underway, organized with the help of non-profit organizations, called Agua4all, which is raising awareness about the lack of safe drinking water and, through public-private partnerships, is installing water taps where they are needed most. But Everts said the problems are not just in rural communities and that they can affect towns near urban centers. “We are also talking about communities reliant on groundwater. Due to a chemical legacy pollution” caused by previous industries, Everts said “little towns in East Los Angeles like Maywood, which has brown water, that’s the manganese that is naturally occurring and then it has all the chemicals like TCE. So this is a problem both in rural areas … and in urban areas across the state, especially areas that have had chemical pollution."